I hooked up the Oculus DK1 and an XBOX 360 wired controller to do more experiments. I’ll start with the demo. First, I downloaded a couple updates. 3) Oculus Utilities for Unity 5 SDK Examples: [1.10.0] – Unzipped to a new folder. Next I created a new empty Unity project, where I’m a version behind the release version. [Unity 5.3.3]. I’ll update to the release version later (currently 5.3.2). Copy the project settings into the Unity project settings (OculusUtilities_SDKExamples_0_1_3_0_beta\ProjectSettings). Import the Oculus Unity Package (OculusUtilities_SDKExamples_0_1_3_0_beta\SDKExamples.unityPackage). Restart Unity and reopen the project. The Oculus DK1 is plugged in and on. The XBOX 360 controller is plugged in. Open the sample scene (Assets\Scenes\FirstPerson_Sample.unity). The nice part about this example scene is that it has the head tracking, controller left stick movement, and controller right stick horizontal looking. Let the baking process complete before hitting `Play`. If baking has not complete, the scene will be black. If nothing happens, hit `Stop` and then `Play` again. Some things to note about the project setup. When copying project settings, at a minimum, the `ProjectSettings.asset` must be copied to avoid a crash on `Start`. When copying project settings, the `InputManager.asset` needs to be copied to support using the `XBOX 360 controller` in the example scene. For capturing video output on the Oculus DK1, the ElGato Game Capture software will not work. [Open Broadcaster Software] (OBS) has to be setup to mirror a monitor in order to capture the Oculus video. 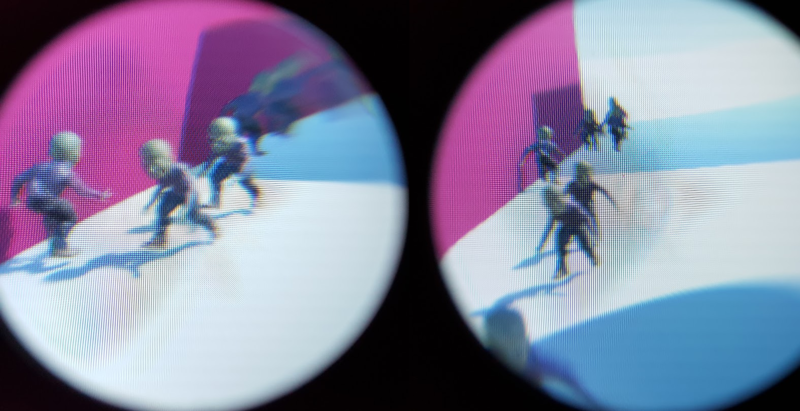 And rolled the Oculus demo setup into my [Setup For Fuse CC] unity package.